"Once more on the plains of the Serengeti, life is more powerful than death, and there remains a place on earth where it is still the morning of life, and the great herds still run free." To date, more than thirty titles originally filmed for presentation in IMAX® theaters have been released on DVD. Some, like Super Speedway, have been excellent. Others, like Hidden Hawaii, have been pretty mediocre. I do not profess to have seen all of them, or even most of them, but Africa: The Serengeti was definitely one of the best I have yet viewed. Quite likely the best known wildlife sanctuary on earth, Serengeti National Park covers almost 13,000 square kilometers in the African countries of Kenya and Tanzania. It is home to more than 30 species of large herbivores and nearly 500 species of birds. Without doubt, however, the "star of the show" is the wildebeest. The Serengeti is home to over 2 million of them, most of which perform an annual 500-mile migration from the southern grass plains to the Maasai Mara Game Preserve in the north and back again. Accompanying these 1.5 million wildebeests on their journey each year are hundreds of thousands of gazelle and zebras. It is this mass migration that provides the central focus of Africa: The Serengeti. As we follow this massive migration, we break away to take a look at some of the Serengeti's other prominent denizens. The rather innocuous elephants, giraffes, baboons, hippopotami, ostriches, storks, and flamingos all have their time on screen. With greater excitement we meet the Serengeti's primary predators, the lions, as well as cheetahs and crocodiles. Of course, this look at the food chain wouldn't be complete without a examination of the Serengeti's cleanup crew; the vultures, jackals, and hyenas. In addition to the migration, Africa: The Serengeti breaks away to look at other important parts of the Serengeti as well. Several minutes are devoted to Ngorongoro Crater, a massive post-volcanic caldera which is a microcosm of the rest of the Serengeti. While the fortunate herbivorous occupants of the crater don't have to migrate and have access to more plentiful water, they do have the same predators to deal with. The Crater is also one of the few places on earth where black rhinoceri still exist in significant numbers. We get a brief glimpse of the daily existence of the nomadic Maasai people, who continue to protect their cattle and families with spears. Director of Photography Andrew Kitzanuk has stuffed Africa: The Serengeti with some of the most awe-inspiring wildlife footage ever caught on film. Wildebeests, overcome with their instinct to migrate, walk right past a pack of lions laying in open ambush. A cheetah runs down a gazelle almost as if it were standing still (complete with "cheetah-cam" footage), and wildebeests gather in huge numbers on the banks of the rain swollen Mara River while ravenous crocodiles line up below, waiting for them to cross. When they do cross, they do so en masse and, as expected, many of them never make it. Lastly, we witness the miracle of birth, as the wildebeests replenish the quarter million of their number lost in their annual journey. If the closing footage of the newborn wildebeest doesn't make you misty-eyed, you are probably made of wood. Africa: The Serengeti is narrated by James Earl Jones. Wonderful original African-esque music from prolific composer Hans Zimmer accompanies the film. Like virtually IMAX® films, this one is rather short, coming in at just under 40 minutes. This short run left me yearning for more. NOTE: The graphic nature of some of the content might make this special interest film just may be a bit too intense for small children. Use your best judgement. Image Transfer Review: While it undoubtedly pales in comparison to watching it in an IMAX theater, Africa: The Serengeti contains a rather splendid video transfer. Detail on most shots is first rate and the colors are wonderful. The only drawback is the occasional digital shimmer, particularly in a handful of early shots, that can be mildly distracting. I suspect that this has resulted from the film's remaster from the large screen format. This film, like all IMAX® films, was shot in 70mm x 70mm film with an original aspect ratio of 1.44:1. The process of remastering the image from the version shown on 65ft x 90ft screens is almost certainly an involving one. 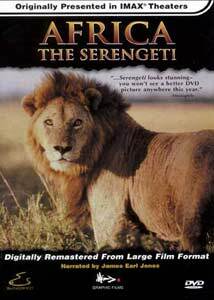 Audio Transfer Review: The audio presentation for Africa: The Serengeti is simply marvelous. The surround channels are in use 100% of the time, either for the ambient sounds of wildlife or to add richness to the Hans Zimmer's fantastic original score (or both). Your subwoofer will come alive with the thunderous rumbling of the wildebeest herds and the rhythmic drums of some of the accompanying music. Add the sense of smell and a warm breeze in your face and it would be like being there. This would definitely be a great disc to demo your home theater system with. Extras Review: The only extras included with this disc are two trailer segments and some DVD-ROM content. The first segment, "Available large format titles", runs just over five minutes and features footage from four additional IMAX® films. The second segment, "Available SlingShot Titles" runs about nine minutes and features excerpts from nine special interest SlingShot DVD titles. Both segments are presented in 2.0 stereo. I was unable to explore the DVD-ROM content but it appears to be primarily links to web-based content. So far as I can tell, the scene selection menu (which features full-motion scene cues) can only be accessed with the menu button on your DVD remote once the film has been started. There is not a link to it from the main menu. To access the main menu from the scene access menu, hit the "top menu" or comparable button on your DVD remote. Unlike some IMAX® films, Africa: The Serengeti is definitely not a film guilty of having too much style and not enough substance. Filled with spectacular imagery and near reference quality audio, this is a must-have for nature lovers.